The island was inhabited at around 3200 B.C. when Cretes showed up. 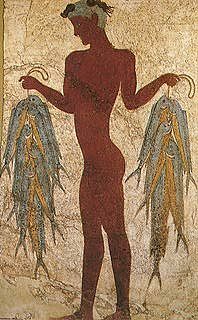 The influence of the Minoan culture on the island was obvious when excavations started on Akrotiri and found a whole village with houses decorated with wallpaintings similar to those found in the Minoan palace in Crete. Before the volcano started its destructive work the island was called Stroggili, from its shape. But in 1500 B.C. happened something that completely changed the story of the ancient world. It was the explosion of the volcano which was in the center of the island and the greater part sunk. The tidal wave which was caused by the explosion , estimated at around 100m high, destroyed the palace of Knossos and did a lot of damage at the north coast of Crete. The site of Ancient Thira, through which Phoenicians, Dorians, Romans and Byzantines all passed, is of particular interest. The city is divided down the middle by the Sacred Way. Apart from the clusters of buildings dating from various different eras, there are the agoras, public baths, theatres, a number of sanctuaries, the House of Ptolemy Euergetes, tombs from the Archaic and Classical periods, Early Christian relies, etc. Graffiti etched out of the nearby rocks record in the ancient Thiran alphabet appellations to the god Apollo and the names of men and youths who danced at the gods festival. At Akrotiri ruins of a Minoan city destroyed by an eruption of the island's volcano around 1500 B.C.